KEMI is encouraging employers to participate in the OSHA National Safety Stand-Down, a voluntary event where employers will talk directly to employees about safety. Managers are encouraged to plan a stand-down that works best for their workplace anytime during May 7-11, 2018. 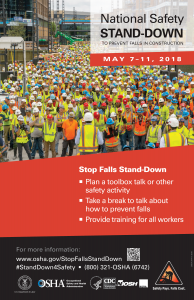 This year, the focus of the Stand-Down is on “Fall Hazards” and reinforcing the importance of “Fall Prevention.” Your organization may participate simply by taking a break to have a toolbox talk or another safety activity such as conducting safety equipment inspections, developing rescue plans, or discussing job specific hazards. Register today and receive a link to KEMI’s Stand-Down for Safety page which contains helpful resources you can share! Additionally, employers will be able to provide feedback to OSHA about their Stand-Down and download a Certificate of Participation signed by Secretary of Labor Thomas E. Perez following the Stand-Down. Organizations are also encouraged to highlight their participation by sharing photos with KEMI via email (safety@kemi.com) or on social media (tag @KEMIworkerscomp and use the hashtag #standdown4safety).